Mindfulness and Schema Therapy presents an eight-session + two follow up sessions protocol for schema mindfulness for therapists and their patients. 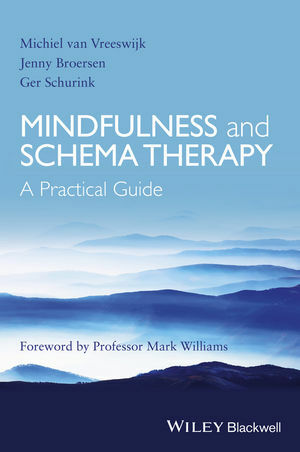 Enhances schema therapy with techniques drawn from mindfulness-based cognitive therapy (MBCT) - a unique integration of two of the most popular treatment approaches in clinical psychology today. Michiel van Vreeswijk is a clinical psychologist, cognitive behavioral therapist, certified supervisor in schema therapy, and co-director at G-kracht mental health care institute. Jenny Broersen is a mental health care psychologist and psychotherapist, and a supervisor in CBT and schema therapy. She teaches post-doctoral courses in schema therapy and CBT. Ger Schurink is a mental health care psychologist, psychotherapist, cognitive behavioral therapist and certified supervisor in CBT. He runs a private practice in the Netherlands and is a trainer in MBCT.